Bumper style I was talking about in the last photo. Added by JimWinsor on 14 January 2008. 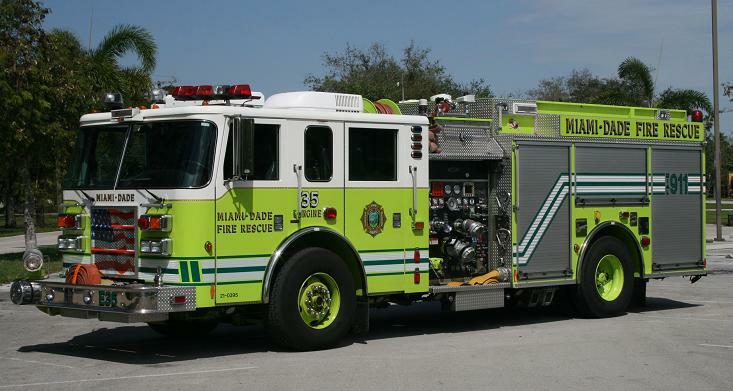 Shane, or maybe another US firefighter: what's the purpose of the stack of 4 small colored lights at the rear of the cab? Added by Michael Feldman on 22 February 2010. They are used to indicate the Engines water tank level. Added by Stuart on 22 February 2010. In the US, I know of many engine companies that run with just 2 firefighters. The lights enable the operator from a distance to kept track of the water level in the tank. When it hits the lowest light, the operator returns to controls. Added by David L on 22 February 2010. Ah, OK, makes sense. So much sense, in fact, that I wonder why all (recent) pumpers with tanks don't have them. Cost, I guess.